Review by AllTheBestFights.com: 2016-05-21, pretty good fight between Joseph Parker and Carlos Takam: it gets three stars. The undefeated Joseph Parker entered this fight with a perfect boxing record of 18-0-0 (16 KOs=89%) and he is ranked as the No.12 heavyweight in the world. He has already fought once in 2016 beating Jason Bergman (=Parker vs Bergman). His opponent, Carlos Takam, has a record of 33-2-1 (25 KOs=76%) and he entered as the No.26 in the same weight class. He suffered his last loss when he faced Alexander Povetkin in 2014 (=Povetkin vs Takam), since then he has won three bouts defeating George Arias in his last one. 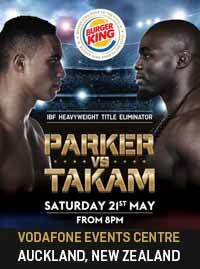 Parker vs Takam, IBF World title eliminator, is the main event of the evening. Watch the video and rate this fight!